Hello and welcome to the 404th installment of the SWD. Third batch of evacuated rebel elements and their families from Al-Ruhaybah, Jayroud, and Al-Nasiriyah in the Eastern Qalamoun arrived at Abu al-Zindeen crossing near the city of Al-Bab in northern Aleppo. The batch reportedly consisted of around 500 rebel elements and civilians, who will be transferred to a camp for internally displaced persons in the city of Jindires, southwest of Afrin. Russian air defence shot down unknown drones which were approaching Hmeimim Air Base. Syrian Arab Air Force conducted air raids over Maaret Hurmah (Maar Tahroma), Al-Tamaneh, Tell Aas, and Al-Habit. According to the Syrian Civil Defense (The White Helmets), four civilians were killed and ten wounded by the air raids over Maaret Hurmah. Hayat Tahrir al-Sham reportedly reached a permanent ceasefire agreement with Jabhat Tahrir Suriya (Ahrar al-Sham and Harakat Nour al-Deen al-Zenki) and the latter’s ally, Suqour al-Sham. The two sides will reportedly keep the localities and checkpoints under their control, as well as release all detainees, open roads, and lift barriers. Hayat Tahrir al-Sham arrested former leader of the Free Syrian Army’s Liwa Shuhada al-Islam, Captain Said Naqrish (Abu Jamal) in Sarmada. Naqrish entered Idlib from Turkey in order to meet with his relatives, who were recently evacuated from Al-Dumayr in the Eastern Qalamoun. Hayat Tahrir al-Sham reportedly arrested Naqrish for participating in Astana peace talks, which were rejected by the group. Said Naqrish defected from the Syrian Arab Army in 2012 and fought in Darayya until the August of 2016, when rebels were evacuated from it. After the August of 2016, Naqrish moved to a political office and was assigned as the director of the political bureau in Liwa Shuhada al-Islam. Islamic State shelled Nahr Aisha, Al-Maydan, and Al-Zahraa areas of the city of Damascus. According to the Syrian Arab News Agency, five civilians were killed and 22 wounded by the shelling of the aforementioned areas. Syrian Arab Air Force and Syrian Arab Army’s artillery targeted Al-Tadamon, Al-Yarmouk camp, Al-Hajar al-Aswad, and Al-Qadam areas south of Damascus. Reports suggest that the targeting affected Jaysh al-Islam near Yalda, reportedly killing at least four elements and wounding a dozen, including the group’s commander Abu Bara. Fourth batch of rebel elements and their families started evacuating from Al-Ruhaybah, Jayroud, and Al-Nasiriyah in the Eastern Qalamoun towards Idlib and Aleppo. Syrian Arab News Agency stated that 47 buses carrying fighters and civilians left the aforementioned localities towards northern Syria. Syrian Internal Security Forces entered Jayroud in the Eastern Qalamoun, after the remaining rebels and their families were evacuated from it today. The forces entered Jayroud in order to establish security and stability, as well as to protect civilians and their property in preparation for the return of the government’s insitutitions to the locality. Syrian Arab Army backed by allies captured Al-Joura orchards in Al-Qadam neighborhood from the Islamic State. 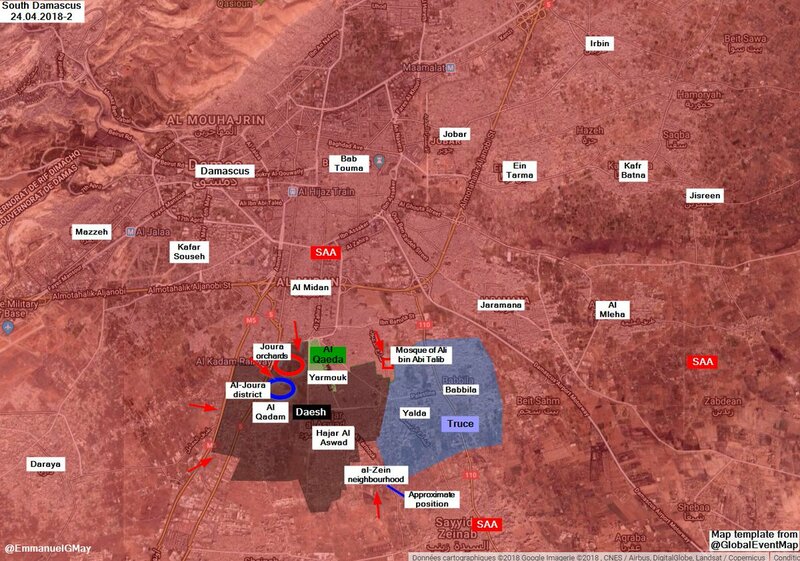 Reports also suggest that the Syrian Arab Army entered the outskirts of Al-Joura district. Islamic State’s Amaq Agency released a statement claiming that the group repelled Syrian Arab Army’s attack on Al-Qadam neighborhood, killing 24 soldiers and destroying a BMP. Islamic State’s Amaq Agency stated that six elements of the Syrian Arab Army were killed in clashes with the Islamic State in Al-Hajar al-Aswad, south of Damascus. Hayat Tahrir al-Sham repelled another Syrian Arab Army and allies’ attack on the 30th Street in Al-Yarmouk camp. Reports suggest that ten elements of the Syrian Arab Army were killed in the failed attack. Syrian Arab Army’s artillery shelled Jubata al-Khashab, north of Quneitra. According to the reports, the shelling of Jubata al-Khashab killed two and wounded four civilians. Rebel factions in Jubata al-Khashab shelled the city of Al-Baath, north of Quneitra. According to the Syrian Arab News Agency, the shelling of Al-Baath wounded 12 civilians. Islamic State-affiliated Jaysh Khalid ibn al-Walid acquitted seven of its executed commanders of murder of the group’s former emir, Abu Hashim al-Idlibi. The seven commanders who were executed a year ago are; Abu Obeida al-Qahtan, Nidal al-Baridi, Khalid al-Jamal, Nader al-Qasim, Uday al-Qasim, Abu Tahrir, and Essam Khalid al-Saleh. Islamic Emirate of Afghanistan (Taliban) attacked an Afghan National Army’s checkpoint in Gapi Murshakar area of Pashtun Kot district. One element of the Afghan Local Police was killed and two wounded in the attack. Islamic Emirate of Afghanistan’s improvised explosive targeted a vehicle of the leader / commander of Jamiat-e Islami, Ghulam Farooq killing him and three other individuals, as well as wounding two individuals in Chaghatak area of Almar district. Afghan National Security Forces killed 19 and wounded 13 elements of the Islamic Emirate of Afghanistan, as well as destroyed three fighting positions and defused 25 improvised explosive devices in Imam Sahib and Khan Abad districts, according to the Afghan Ministry of Defense. Among the 19 killed elements are four Islamic Emirate of Afghanistan’s commanders; Abdulmalek, Imran Khan, Ghazi Mojahed, and Nasir. Islamic Emirate of Afghanistan attacked two Afghan National Army’s posts in Pul-e Khomri district. Five elements of the Afghan National Army were reportedly killed and six wounded in the attacks. Afghan National Security Forces killed Islamic State’s commander Qari Zahed and arrested two elements of the group in Chapa Dara district. Islamic Emirate of Afghanistan overran an Afghan National Police’s post in Tagab district. Seven elements of the Afghan National Police were reportedly killed, while the remaining elements withdrew from the post. Islamic Emirate of Afghanistan seized an RPG launcher, a heavy machine gun, and large quantities of ammunition from the post. Islamic Emirate of Afghanistan assassinated an Afghan Local Police’s commander in the city of Kabul. Afghan National Security Forces killed 11 elements of the Islamic State and destroyed a motorcycle in Pachir Aw Agam and Sherzad districts. Islamic Emirate of Afghanistan overran an Afghan National Security Forces’ base and six posts in Gulchain area of Qadis district, which resulted in the group’s capture of the aforementioned areas. Islamic Emirate of Afghanistan’s Al-Emarah News stated that 12 elements of the Afghan National Security Forces were killed and five arrested, while 29 elements, including commander Mulhim surrendered to the Islamic Emirate of Afghanistan. One element of the Islamic Emirate of Afghanistan was killed and five wounded in the encounters. Islamic Emirate of Afghanistan seized 27 assault rifles, two PK machine guns, four pickups, and eight motorcycles from the overran base and posts. Afghan National Security Forces killed five elements of the Islamic Emirate of Afghanistan in Kohsan district. Islamic Emirate of Afghanistan attacked and destroyed an Afghan National Army’s checkpoint in Khojoryano area of Adraskan district, reportedly destroying two vehicles, as well as killing two and wounding two soldiers in the process. Islamic Emirate of Afghanistan’s improvised explosive device destroyed an Afghan National Army’s armored vehicle in Bazar area of Adraskan district. Islamic Emirate of Afghanistan’s sniper killed an element of the Afghan National Army in Sarpul area of Obe district. Islamic Emirate of Afghanistan seized two Afghan National Police’s posts in the city of Ghazni, reportedly killing 12 and wounding five elements of the police. One element of the Islamic Emirate of Afghanistan was killed in the encounter. Islamic Emirate of Afghanistan seized five assault rifles, two heavy machine guns, a grenade, and large quantities of ammunition from the posts. Islamic Emirate of Afghanistan overran an Afghan National Army’s post in Shalgar district, killing one and wounding two soldiers. Islamic Emirate of Afghanistan overran an Afghan National Police’s base in Nealak area of Bala Buluk district. According to the reports, 17 elements of the Afghan National Police were killed and two arrested, as well as two armored personnel carriers destroyed in clashes for the base. Two elements of the Islamic Emirate of Afghanistan were wounded in the encounter. Islamic Emirate of Afghanistan seized two armored personnel carriers and 20 assault rifles from the base. Islamic Emirate of Afghanistan overran an Afghan National Army’s checkpoint in Nawi Karez area of Farah Rod district. Afghan National Security Forces killed 11 and wounded two elements of the Islamic Emirate of Afghanistan, as well as destroyed several weapons depots and ammunition caches in Chora district. Afghan National Security Forces killed 16 and wounded four elements of the Islamic Emirate of Afghanistan, as well as destroyed an ammunition cache, a vehicle, and a motorcycle in Shamulzayi district, according to the Afghan Ministry of Defense. Among the 16 killed elements are reportedly a commander of the Islamic Emirate of Afghanistan and three suicide bombers. Islamic Emirate of Afghanistan attacked an Afghan National Army’s patrol in Maltani area of Tarnak Aw Jaldak district. Two elements of the Afghan National Army were killed and four wounded, while two elements of the Islamic Emirate of Afghanistan were wounded in the attack. Islamic Emirate of Afghanistan also destroyed an armored personnel carrier and a pickup in the attack. Afghan National Security Forces killed seven and wounded three elements of the Islamic Emirate of Afghanistan, as well as destroyed a vehicle and a motorcycle in Jerashk and Nad Ali districts. One of the seven killed elements was the Islamic Emirate of Afghanistan’s commander, Qari Ezatollah. Islamic Emirate of Afghanistan ambushed and destroyed an Afghan National Police’s vehicle in Hazargano area of Nad Ali district. Islamic Emirate of Afghanistan’s improvised explosive device destroyed an Afghan National Army’s armored personnel carrier in Sarkhadoz area of Nawa-I-Barakzayi district. Islamic Emirate of Afghanistan’s snipers reportedly killed and wounded nine elements of the Afghan National Army in Nawa-I-Barakzayi and Nad Ali districts. Ayman al-Shami denied that HTS captured Captain Saeed Narkash (“Abu Jamal”).